Writing a residency interview thank you letter is a good practice especially if you have been interviewed or will be interviewed soon. Taking the time to write a small note to show your appreciation can go a long way with the interviewer and may even open a dialogue between you and the director of the program you wish to enroll in. If you are not really sure how to write a thank you letter for your after residency interview, it might be better if you ask for help from the experts. 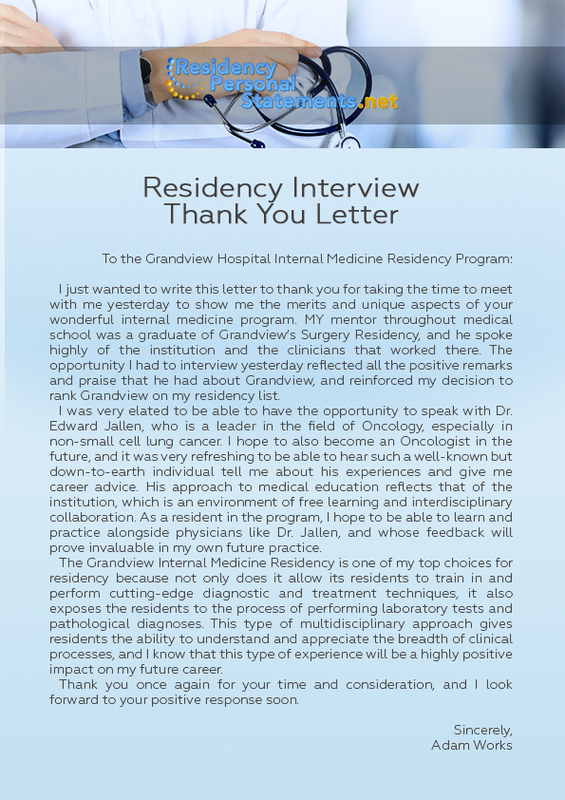 Residency interview thank you letter is sent to let the interviewer know that you are grateful for the help and professional advice he gave you during the meeting. This is also a way to let him know about the great experience you had during the interview. And lastly, it is a good way to thank him for the time and opportunity he lent to get to know you. However, mistakes may arise while you were writing the letter. These are the common mistakes people make in writing residency interview thank you letters. It is better to know these before you get messed up and ruin your application in the future. Not addressing it to the right person. Know the person who to send the letter to. Know the name and position title of the interviewer so that you will be able to address him or her in your letter. When to send. Don’t wait too long to send your letter. The ideal time to send it is 48 hours after the interview. Any time longer than this, the interviewer will no longer recall meeting with you. How to send. This is a rookie mistake some applicant forget to consider. There is the right courier to do it. Send it through email or postal mail and not after you leave the office by leaving it to the receptionist. Don’t know what to say. Your content should be short but sweet but not too sweet. A 2-3-paragraph letter will do. Discuss the good experience you had during the interview but don’t detail everything. Do not make it any longer. A simple thank you and gratitude note will be enough. Doing it just for the sake of doing it. 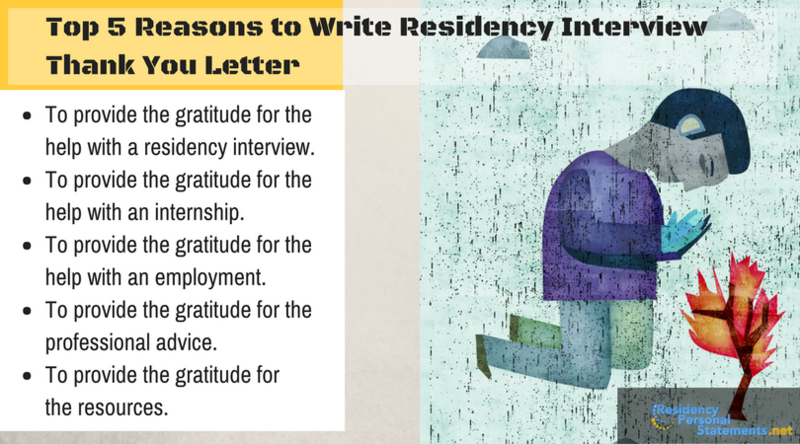 Some applicants think that sending a thank you letter after a residency interview is something automatic thing to do. Some thank you letters residency interview forces people to write include such weird phrases as “I send this letter because I have to” – you will automatically kill your application. You have you be genuine and thankful in a more personal way. Sending it with a thank you gift. Some people send a basket of mini muffins. Do not do this. This may signal that you are trying to sway the interviewer and will eventually affect your application – and not in a good way. Avoid these mistakes and write your thank you letter in a personal, genuine, and simple way. Do not overdo things. It is a simple thank you that people will appreciate. For professional advice, you may want to check our service page. 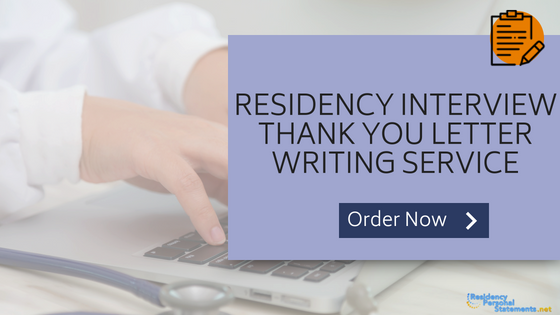 Before writing residency post interview thank you letter you can start with brief residency thank you notes of what is important to you to add in. But not everyone is confident with their writing abilities which can be frustrating especially if you want to send the interviewer and the school your letter of appreciation. Fortunately, help is not that hard to find especially when there are several writing services that you can go to. And while you’re searching for assistance for your writing, it might be better if you start looking for the best which is us. Writing thank you letters after residency interview shows how appreciative you are for the time given to you by the interviewer. How to deliver the lines may not be your strong suit but with us, you’ll be able to show your appreciation perfectly. If someone takes time or effort (in an internship, employment or residency interview), or shares advice or resources (in an informational interview), it is considered professionally polite to acknowledge it. Thank you letters shouldn’t be as long as an essay but it should sum up how you felt during the interview and expressing your interest in the program that they are offering. Expert writers of our professional residency personal statement service are quite capable of drafting the best residency interviews thank you letter for you. If you know that the employer/residency director is making a decision in the next few days, send an email, so it arrives on time. But if it’s going to be a few weeks, a handwritten note is also fine. Why worry about your residency interview thank you letter when you can get professional assistance from us? You just need to provide us with relevant information regarding your interview as well as who to address and we’ll draft a letter that you can review. Your thank you letter after interview residency requires will lay yout way to success, trust us. We know exactly how to write perfectly balanced residency interview thank you letter. Don’t waste your time and get professional help right away!